This poem was written in response to a Poets & Writers 7/21/17 prompt to look at a photograph from a recent trip and write a poem that "explores the distance between your current self and the photograph, and between an image and a feeling or memory." 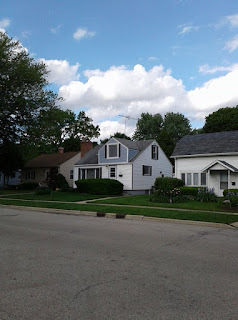 I visited my birthplace town and home for twenty-one years, Elgin, Illinois in May of this year, taking photos of my first home and my dad's sister's home. It is dedicated to Linda Sjurset Esposito, who lived across the street from me in Elgin, Illinois. Her birthday is today 8/29/17. 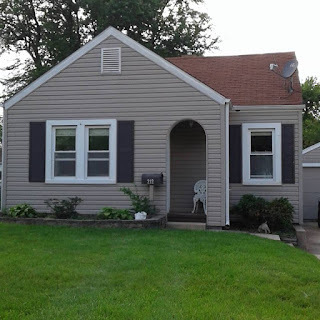 My first Fonte-Dice home on Melrose, Ave., Elgin, Illnois. It is a Sears & Roebuck Craftsman house. straining red berry juice through white cheesecloth.